A brilliant yellow gold brings a beautiful, warm style to this three stone ring. The yellow gold band is buffed to an arresting shine and provides an exquisite foundation and setting for three precious gems. A single tanzanite stone brings a light violet color to the ring and measures 4mm, while two 0.15 carat diamonds which sit on either side of the tanzanite gem make for a graceful display. This ravishing ring can only be found at premium jewelry retailer Apples of Gold. Also available in 14K White Gold (shown below), 18K Gold or Platinum by request. 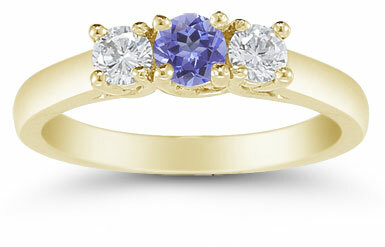 Apples of Gold uses only the finest gold and gemstones to make this ring your ideal lifetime choice! 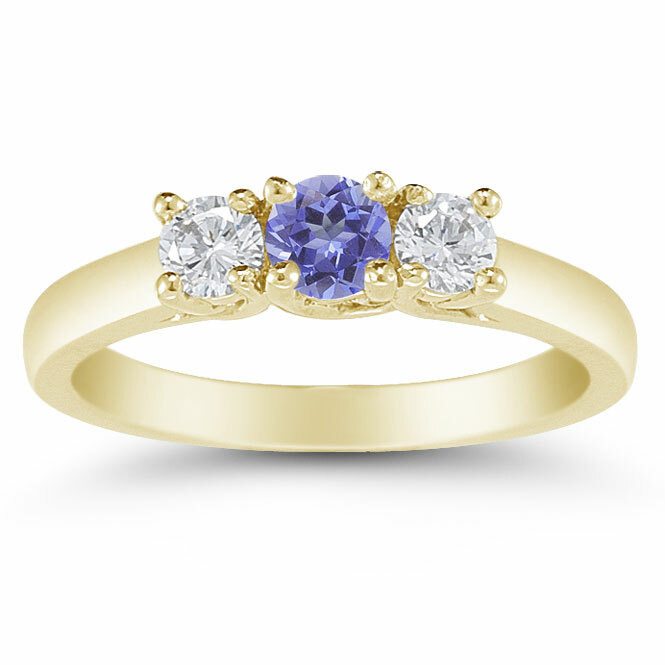 We guarantee our Three Stone Tanzanite and Diamond Ring, 14K Gold to be high quality, authentic jewelry, as described above.